Looking for a romantic getaway (honeymoon/anniversary) or a small family vacation (can sleep 2 adults and 2 kids), Bear's Escape cabin will offer you the rustic elegance you are looking for. Conveniently located between Gatlinburg and Pigeon Forge, only 1.2 miles off of the main parkway, this cabin has a peaceful private wooded setting with two decks featuring rockers, grill, log picnic table, and a large bubbly hot tub. While on the deck you will feel completely surrounded by nature, a million miles from the bustle left behind. 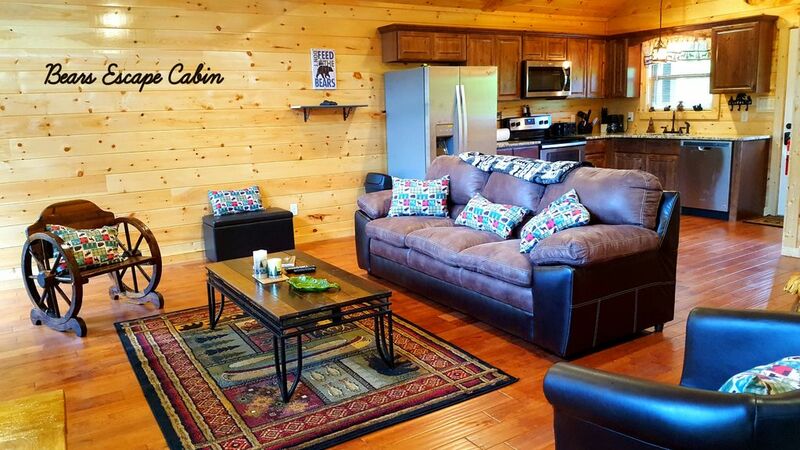 This beautifully decorated cabin offers custom log furniture, a gas fire place, a full kitchen, flat screen HD TVs (with HD premium cable), DVD players with movies to view, High-Speed Internet, pool table, foosball and air hockey table, and 2 daybeds. The Master Bedroom is designed with a luxurious King bed, cozy fire place, a romantic Jacuzzi tub, and a full bath that has a shower. Bear's Escape Cabin is the perfect place to unwind for a well deserved getaway. ONE NIGHT RENTALS UPON REQUEST! Reserve your stay at Bear’s Escape Cabin by submitting a date request on the right of this screen. Ready for winter magic, Bears Escape Cabin is just a 10 minute drive from Gatlinburg's Winter Wonderland Festival activities with music, street performers, venders, arts and crafts, food, light displays, huge Christmas tree, and more.. Festival runs Nov-Feb. The cabin is also within a 10 minute drive to 3 rivers great for swimming, wading, frog hunting, or just sitting on a rock relaxing. Close to the national park where there are many waterfalls some with reflective pools to swim in. If your looking for Spring and Summer Fun book Bears Escape now. Explore great Gatlinburg attractions at one of its unique museums, craftsmen fair, miniature golf courses, water parks, motion simulators and Go-Karts or bumper cars. Check out one of the nation's best aquariums, Ripley's Aquarium of the Smokies. The Gatlinburg Ripley's also features mini golf, haunted adventures, mirror maze, a moving theater, a fun zone and, of course, the famous Ripley's Believe it or Not Museum. Gatlinburg is also known for its Golf, specialty shops, restaurants, Whitewater Rafting, biking, hiking, and Canopy zip lines. Or adventure out on one of the many amazing hikes in Smokey Mountain National Forest, here you will find true serenity. Here you can enjoy a day at Dollywood. Or one of the many other activities found in Pigeon Forge, such as water parks, Titanic Museum, Wonder Works, Magic Quest, miniature golf, go karts, fairs, dinner theater shows, shopping outlets, and pancake houses galore. Bears Escape Cabin is a great location to try out Dollywood — This year open the first winged roller coaster in the country. The ride, which opened in April, delivers a heart-stopping twist on regular roller-coaster seats. Seats jut out on either side of the track, so have nothing above or below them but air — giving them a real sensation of flying as they scream at more than 60 mph through four inversions and a zero-gravity roll. Of course, the 200-foot-high coaster’s cars are built to look like the national bird. Trillium Gap Trail meanders through an old-growth hemlock forest and actually runs behind the 25 foot high waterfall. The cool, moist environment near the falls is ideal for salamanders and summer hikers. The hike is 3 miles roundtrip and considered moderate Trailhead: From the parkway in Gatlinburg, turn at traffic light #8 and follow Historic Nature Trail into Great Smoky Mountains National Park. Take Roaring Fork Motor Nature Trail to stop #5 where there is a large parking area. This one is close and absolutely beautiful. I last hiked it with my 60 year old mother and 4 nieces and nephews ranging in age from 3-11 years old. We saw 3 bears at a distant, swam in the reflective pool of the falls, and had a fun-filled day without over doing it. Reserve your stay at Bear's Escape Cabin by submitting your dates. You will then receive an email back with a quote for you to confirm and schedule payment. If you bring unauthorized pets into the cabin, you will be charged $250. All pets must be disclosed and approved prior to booking. We are Veterans who fell in love with the Smokies. This area has so much to offer that we could visit it 100 times and still not experience all that we are interested it. The beauty, the hiking, the wildlife, the attractions, the shopping, the restaurants….the fun. We love the beauty of this area and the rustic elegance of this cabin. Close easy drive to downtown. Nature watching from the back decks. Enjoying morning coffee in a log rocker on the private back deck. Relaxing in large hottub. Romance of the masterbedroom suite that has a fireplace, jetted jacuzzi and vertical spa shower. Fun gameroom with billards pool, fooseball, air hockey, hdtv, dvd, wifi, puzzles, board games...etc. My husband and I thoroughly enjoyed our stay! It was the perfect cabin for the two of us, and it couldn’t have been more convenient to both Pigeon Forge and Gatlinburg. Pictures don’t do justice of how nice Bears Escape is. The winding steep roads are a little challenging to get there but it’s worth it. Perfect location situated between Gatlinburg and Pigeon Forge. Beautiful cabin very clean it was a great weekend getaway!!! Cabin was very clean and updated. It was by far the nicest place we’ve ever rented. Very nice cabin, great location! We enjoyed staying at this cabin very much. The whole cabin is very comfortable and cozy. It was nice to be so close to everything. We enjoyed the hockey, pool, and foos ball table! Lots of great things about this cabin to love. Highly recommend staying here. The cabin and location was perfect. Close to activities in Gatlinburg, Pigeon Forge, and Smokey Mountain National Park. Minutes from wading river spots and swimming holes. Less than 2 miles to glass enclosed waterpark. Just 2 miles from trolly stop with free parking. Just 4 miles from the center of downtown Gatlinburg. Less than 4 miles to the Ripleys Aquarium. And only 7 miles to downtown Pigeon Forge where there are shops, restaurants, museums, minature gold, gocarts, amusement parks...etc.